Orlando is the #1 destination to visit in the USA, welcoming a record breaking 72 million visitors in 2017. The holidays are a truly magical time to visit Orlando, with fabulous events all around. When you’re staying at a vacation home, it opens up even more amazing ways to spend the holiday season. Keep reading to discover fun ways to spend the holidays at Reunion Resort. One of the featured luxury dining experiences at Reunion Resort is Eleven. Situated at the top of the 11th floor of the towering Reunion Grande building, Eleven provides a luxurious dining experience for the whole family. Enjoy a Christmas dinner at Eleven with a menu featuring seasonal specials including Winter Fig Salad, Prime Rib, Pan Seared Sea Bass and more! You can even watch the magical Walt Disney World fireworks with a stellar view from the restaurant. Spend the holidays dining here, reservations are highly recommended. View more Reunion Dining Experiences! The Reunion Resort spa is a great way to treat yourself and your loved ones this Holiday season! You have the option to visit the boutique spa in the resort, or even have the masseuse come to you! Enjoy a poolside massage and be able to truly relax without stress this holiday season. Be sure to call 407.662.4772 to book your holiday spa trip! Make your holidays Magical by staying at an amazing Magical Vacation Home rental. Make a meal with the whole family at your own kitchen and sit down to dine all together. Escape the crowds of the theme parks by relaxing in your own private villa. Even get to decorate your home for the holidays with Christmas tree rentals! Holidays are truly magical with a stay at Magical Vacation Homes! 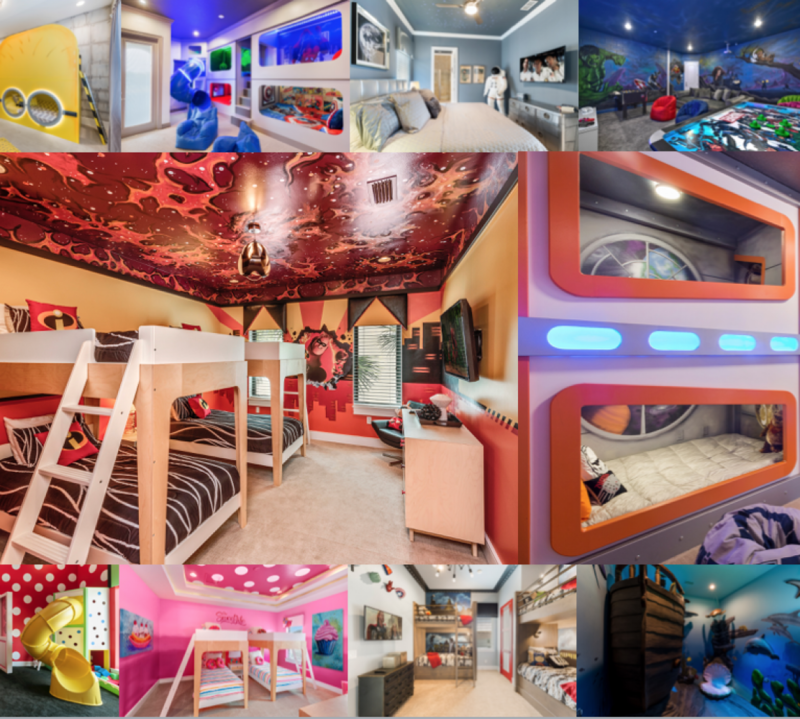 You can even stay in your very own Castle at The Reunion Castle, a brand new home designed for your vacation with 10 bedrooms, a custom infinity pool, secret playrooms and the same high-tech golf simulator that the pros use! Reunion Resort features 3 award winning golf courses designed by some of the biggest names in golf. Featuring the Arnold Palmer Legacy Course, the Tom Watson Independence Course and the Jack Nicklaus Tradition Course, Reunion Resort is truly a golfer’s paradise. Spend the holiday season enjoying the beautiful Florida weather and golfing on some of the best courses in Florida. On your vacation to the Sunshine State, maximize your time soaking up the sun at the beautiful Reunion Resort pools! Even during the colder months of the Holidays, Florida weather is perfect for relaxing poolside! Reunion Resort features 8 different community pools in addition to a Water Park and Pool exclusive for registered house guests — ask our reservations team for more info about house guest registration! Of course, a majority of our rentals include your own private pool, but if you’re looking to socialize poolside this holiday season, Reunion Resort pools are the place to be! Maximize your time during the Holidays at Reunion Resort with all of these incredible amenities! Holidays in Orlando are unlike anywhere else, and are sure to be a magical time!